Severe Bleeding is associated with a loss of excessive amount of blood. It may be caused by an extensive open wound or damage to a blood vessel, which may take place internally. All cases of Severe Bleeding should be evaluated by a trained medical professional, as soon as possible! DO NOT wait! Failure to obtain evaluation as soon as possible may result in serious injury or death. Call 911 (or your local emergency number) immediately, if you are experiencing Severe Bleeding. What are the Causes of Severe Bleeding? What are the Signs and Symptoms of Severe Bleeding? How is First Aid administered for Severe Bleeding? 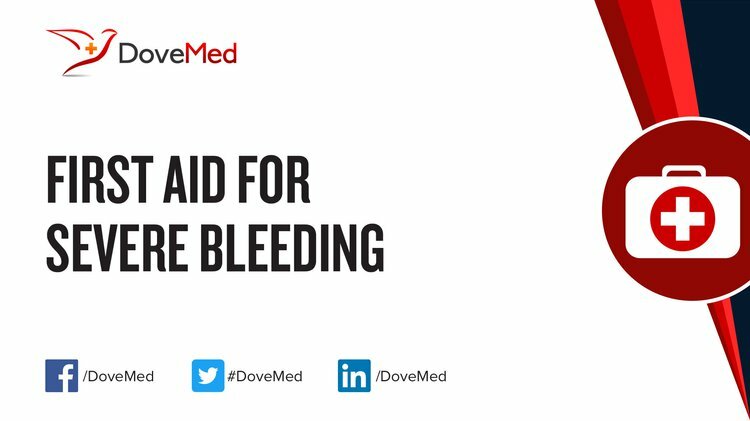 Who should administer First Aid for Severe Bleeding? A person(s) nearby may administer initial First Aid, but one should call 911 (or your local emergency number) or seek medical help immediately. What is the Prognosis of Severe Bleeding? The prognosis is dependent on the amount of blood loss and timely manner in which treatment is administered. How can Severe Bleeding be Prevented? Neunert, C., Noroozi, N., Norman, G., Buchanan, G. R., Goy, J., Nazi, I., ... & Arnold, D. M. (2015). Severe bleeding events in adults and children with primary immune thrombocytopenia: a systematic review. Journal of Thrombosis and Haemostasis, 13(3), 457-464. Gale, A. J., Bhat, V., Pellequer, J. L., Griffin, J. H., Mosnier, L. O., & Von Drygalski, A. (2016). Safety, Stability and Pharmacokinetic Properties of superFactor Va, a Novel Engineered Coagulation Factor V for Treatment of Severe Bleeding. Pharmaceutical research, 33(6), 1517-1526. Winkelhorst, D., Kamphuis, M. M., de Kloet, L. C., Zwaginga, J. J., Oepkes, D., & Lopriore, E. (2016). Severe bleeding complications other than intracranial hemorrhage in neonatal alloimmune thrombocytopenia: a case series and review of the literature. Transfusion, 56(5), 1230-1235. De Robertis, E., Kozek-Langenecker, S. A., Tufano, R., Romano, G. M., Piazza, O., & Zito Marinosci, G. (2015). Coagulopathy induced by acidosis, hypothermia and hypocalcaemia in severe bleeding. Minerva Anestesiol, 81(1), 65-75. Pénzes, K., Rázsó, K., Katona, É., Kerényi, A., Kun, M., & Muszbek, L. (2016). Neutralizing autoantibody against factor XIII A subunit resulted in severe bleeding diathesis with a fatal outcome–characterization of the antibody. Journal of Thrombosis and Haemostasis, 14(8), 1517-1520. Ranucci, M., Martinez, B., Colella, D., & Haxhiademi, D. (2016). Management of Severe Bleeding in Cardiovascular Patients. In Point-of-Care Tests for Severe Hemorrhage (pp. 107-124). Springer International Publishing. Schaefer, B., & Tarango, C. (2017, June). Project Stop-Bleed: Slashing Time of Factor Product Replacement in Severe Bleeding Disorders in the Emergency Department. In PEDIATRIC BLOOD & CANCER (Vol. 64, pp. S61-S61). 111 RIVER ST, HOBOKEN 07030-5774, NJ USA: WILEY. Matteau, A., Yeh, R. W., Camenzind, E., Steg, P. G., Wijns, W., Mills, J., ... & Mauri, L. (2015). Balancing long-term risks of ischemic and bleeding complications after percutaneous coronary intervention with drug-eluting stents. The American journal of cardiology, 116(5), 686-693.